COFFS COAST (NSW) – Six CAMS Australian Rally Championship (ARC) crews have been handed free entry to a winner-takes-all final on the world stage at Kennards Hire Rally Australia in November. The finalists in the second-tier ARC2 category of the national series were confirmed after the penultimate round at Lightforce Rally SA. Three ARC2 four-wheel drive finalists and three two-wheel drive finalists will receive free entry and a set of MRF tyres to do battle at Kennards Hire Rally Australia on 16-19 November. The highest-placed crews in each class will drive away with the 2017 CAMS ARC2 titles. 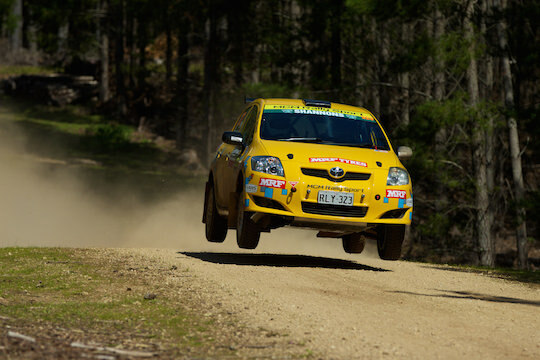 Free entry for top ARC2 teams is one of several opportunities Rally Australia organisers have provided to encourage national competitors in the world event. In the ARC2 four-wheel-drive class at Lightforce Rally SA last weekend, Contel Mobile Communications’ Craig Brooks finished top of the table and claimed his first ARC podium. McM Rallysport’s Stephen Mee topped the two-wheel drive class. Craig Brooks said he was thrilled to grab a spot in the ARC2 final. “The ARC2 final is what we have been aiming at all season so, we are really excited to go to Coffs Harbour and bash it out with the best second-tier guys in the country,” he said. Stephen Mee said the introduction of ARC2 had helped his team start on the path towards national competition. “We’ve always wanted to do ARC and with ARC2 coming along it’s given us a stepping stone to see what goes on at national level and to help us plan for what we might want to do in the future and it’s been really fun,” Mee said. Kennards Hire Rally Australia Clerk of Course Wayne Kenny welcomed the six ARC2 competitors to the event entry list. “Rally Australia is the one event on which a domestic crew, providing they are appropriately licensed and have a car that meets the relevant regulations, can contest a World Championship event alongside the fastest rally drivers on the planet,” Kenny said. “That’s a priceless motorsport opportunity. Crews who missed out on the six ARC2 free entries will have other incentives to enter Rally Australia. The new Kennards Hire Cup offers a total of $5000 prize money to entrants in Rally Australia’s ARC section who have not registered for championship points and have not won or placed in an ARC event this season. And the Coffs Coast event also will host the season finales of the New South Wales and Queensland State Rally Championships. Mentor Tyres Chief Executive Officer and importer of MRF Tyres for Australia Vivek Ponnusamy said he was pleased to be a part of the CAMS ARC2 initiative. “ARC2 is the best platform for young drivers and state competitors with limited budget to step up. This is in line with MRF’s mission of helping and supporting club and State-level competitors to raise up to national and international level,” he said. ARC2 was introduced in 2017, offering a pathway for State-level competitors to step up to national level competition. ARC2 competitors nominate two ARC events, including their home round, where they are eligible to score points.